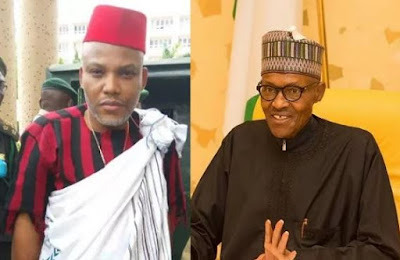 The fugitive leader of the Indigenous People of Biafra, Nnamdi Kanu has insisted that President Muhammadu Buhari is dead and buried. This was contained in his second broadcast released yesterday after he mysteriously surfaced at the Wailing Wall in Jerusalem, Israel. According to the separatist leader who disappeared on the 14th of September, 2017 after his father's house in Afaraukwu in Umuahia, Abia State was invaded by Nigerian soldiers last year, Buhari died last year in Saudi Arabia and has been intelligently replaced with a 'Body Double' from Sudan named Jubril. "Buhari died because he dared to touch me and I must warn everybody especially those who are harbouring ill-will towards me that what happened to Buhari will also happen to them. Buhari was replaced with a man, that very thing from Sudan, (named) Jubril. A very special programme is coming up next month where I will completely and totally unmask Jubril with DNA evidence and forensic pictorial evidence. It will be clear to the whole world that the person in Aso Rock is fake," Kanu alleged. He further stated that the certificate saga Buhari is engulfed in is a deliberate attempt by the Independent National Electoral Commission, INEC, to bar him from contesting so that the impostor could return to Sudan. He described the 'late Buhari' as the "very worst kind of a stark and compound illiterate, and evil genocidist" who is now a skeleton in his grave. He threatened that Nigeria which he regards as a 'zoo' is set to collapse with President Buhari. It would be recalled that Nnamdi Kanu was rumoured to be killed in the Operation Python Dance II exercise carried out in his hometown last year by the Nigerian troops.